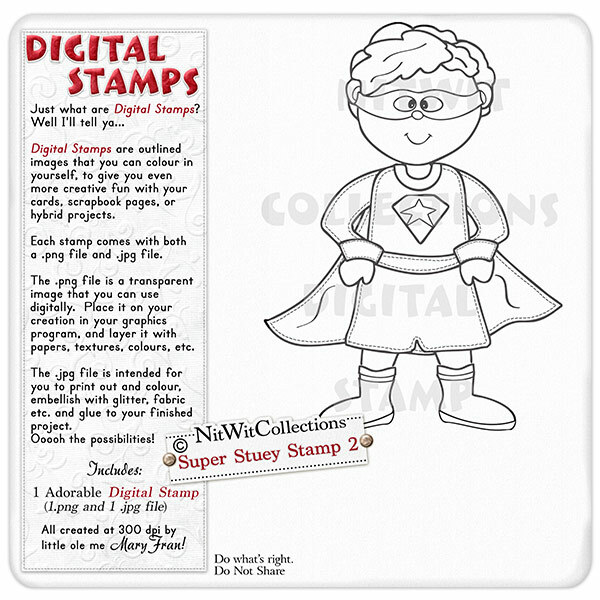 Super Stuey Stamp 2 is our superhero himself. You can now make your superhero into the likeness of you're choosing. The choice is yours with this digital stamp. A great creative addition for your card making, scrapbooking, and hybrid scrapbooking projects. 1 Superkid Stamp (2 files - 1 image is a .png file and 1 is a .jpg file format). Digital Stamps may be incorporated into a projects, but are not available for resale by any License holders.